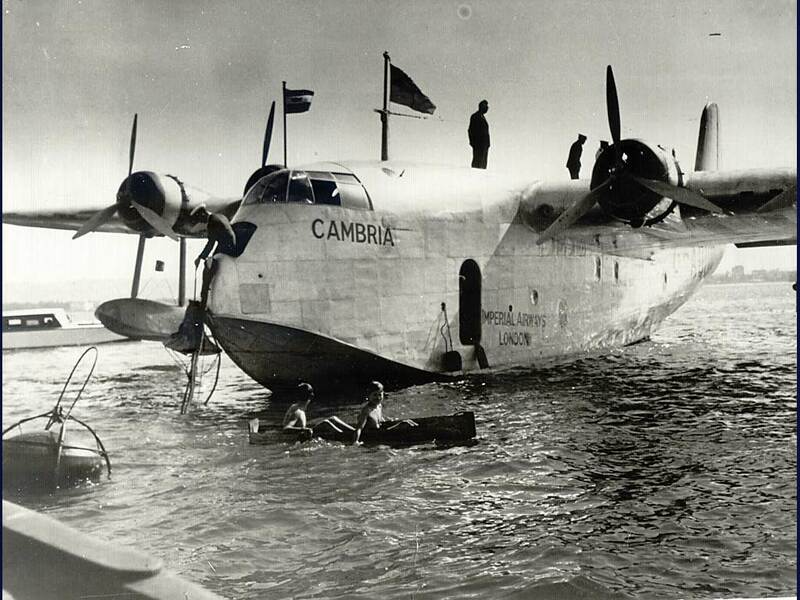 The era of the flying boat began in Durban on 22nd May 1937 with the first of two survey flight when the Cambria, a Short Empire C-Class flying boat of Imperial Airways, landed on the bay near the Point Docks. A week later on 29 May Courtier arrived on the second survey flight having been piloted from the UK by Captain E.S. Alcock, the brother of John William Alcock who, together with Arthur Whitten Brown, had been first to fly the Atlantic. The Cambria after her arrival in Durban. She was set up at the time for survey flights and had long-range fuel tanks and no portholes for passengers to peer out of. Courtier left Durban on 31st May but only got as far as Lindi in Tanganyika before being ordered to return to Durban to pick up passengers for the first commercial flight to the UK. She finally left Durban on Sunday morning, June 6, carrying five passengers and 1032 pounds of mail. The aircraft used on the first commercial flight to Durban was Canopus piloted by Captain Attwood which left Southhampton on 2nd June and arrived on 8th June about 12:20pm.. Centurion landed in Durban on July 5 carrying the first un-surcharged mail from Britain at the cost of a penny-and-a-half per ordinary letter and postcards at 1one penny. The trip from Britain initially took six-and-a-half [later cut four-and-a-half ] days and there were twenty stops along the way for refuelling and to allow passengers to rest. The flying boats very seldom flew at night and their route was carefully planned so that there was always luxurious accommodation available for the passengers overnight. The flying boats were initially moored to buoys off Salisbury Island and passengers were ferried in fast launches from there to the Gardiner Street jetty or to the small craft harbour at the Point. Imperial Airways began to build a hangar and slipway in the area adjacent to the Prince Edward Graving Dock early in 1939 and moved in on 5 April 1940 having become BOAC in the interim. An Imperial Airways [later BOAC] office was located in town in Club Arcade which could be reached in person or on the telephone numbers 20505/6/7. 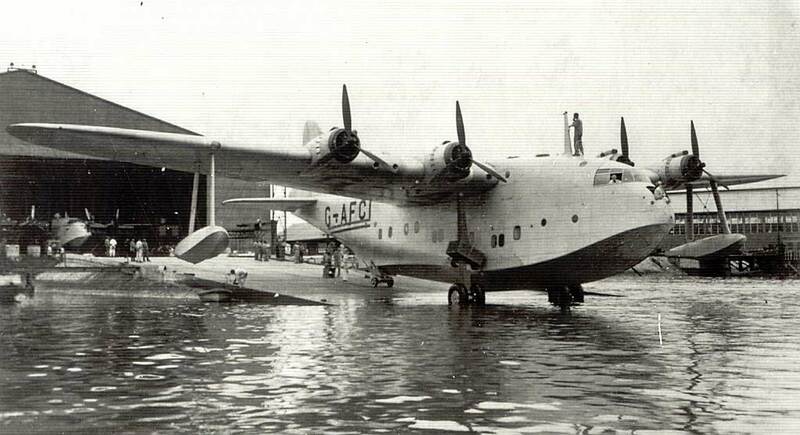 The closure of the Mediterranean air routes during WWII led to Durbans becoming a major overhaul centre for the flying boats and an engine repair and maintenance workshop was established in Sydney Road. This was apparently just across the road from a scrap metal merchant which later lead to the firing of a BOAC employee for selling engine parts as scrap. My research into flying boats in Durban was greatly assisted by local surgeon John Buchan who is busy with a major book on the subject. Paging through his files I came across a copy of a luncheon menu which gives us a very good idea of the how passengers must have been pampered while aboard. This particular meal was served aboard Centurion on 3 February 1938 on one of the days during a trip from Lake Naivasha in Kenya to Durban. Among the delights on offer were Potage Jackson, whatever that might be, Iced Asparagus, Fricasee of Lamb Therese, Boiled Potatoes and a cold buffet including Roast Round of Beef, Baked Upland Ham and a Summer Salad. The Golden Hind was one of three "G" Class Short Flying Boats which were essentially stretched versions of the "C" Class machines. 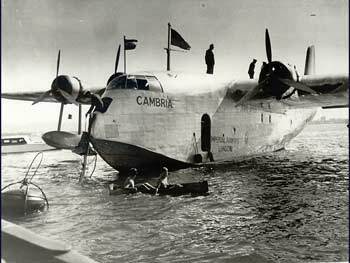 She mostly served on the East African routes but was a fairly frequent visitor to Durban during WWII for maintenance. <== Click picture to view an enlargement. The passenger flying boats gave sterling service up to and during WWII but the emergence shortly after the war of land-based passenger aircraft capable of flying great distances meant that their days were numbered. Grace and beauty gave way to commercialism when Canopus left Durban for the last time in October 1946 and was scrapped the following month. Champion, piloted by Captain FH Perkins, took off from Durban on 5 March 1947 on the penultimate flight to the UK and a glorious era in Durbans history was brought to a sad close the following week on 12 March when Caledonia piloted by Captain Peter Horne took off from the bay. None of the aircraft were spared from the scrap yard which is a crying shame in my book. This picture of Canopus was taken shortly before her last take-off from Durban. <== Click picture to view enlargement.